Many of the coves along the northern British Columbia coast and the Alaskan panhandle were narrow, rocky, and steep-sided, so anchoring or dragging the boat ashore were out of the question. That’s when one of the variations on the Pythagorean mooring system that Hartmann describes, came in handy. 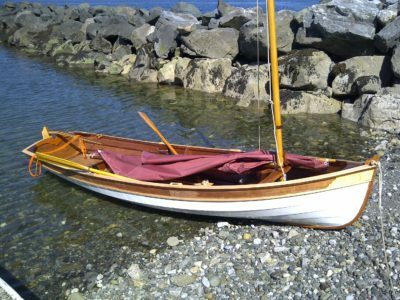 Seaford skiffs first appeared in the shallow marshes around the New York town of Seaford, Long Island, in the early 1870s. They are an evolutionary product of skiffs commonly used by local baymen for hunting waterfowl, digging clams, and fishing. Boatbuilder Samuel Gritman is credited as the primary originator of the Seaford type, but other builders such as Paul Ketcham of Amityville, and Charles Verity and his son Sidney of Seaford, built many and contributed their own modifications to the design from its inception through the 1950s. The Odyssey 165 is an unusual rowboat for touring and exercise. It is specifically for use with the FrontRower, a drop-in forward-facing rowing system. With the oars fully supported by the rowing rig, there’s no need to make the boat wide enough to provide a workable span for conventional rowlocks, nor stout enough to take the strain of rowing on the gunwales. 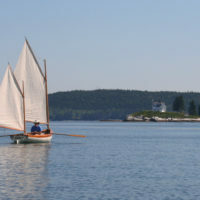 The Odyssey has the proportions of a canoe, offers the same view over the bow, and is similarly efficient converting effort into forward progress. It was a very gentle bump. I’d been sleeping comfortably at anchor after a long day on the water, but I was wide awake in an instant. A few seconds later, it came again—a firm nudge from below interrupting the soft, easy motion of my boat—and this time WAXWING stopped moving. I was aground. I checked my watch—3:30 in the morning, still an hour and a half to go before low tide. The Pythagorean mooring technique appeared in Roger Barnes’s delightful and informative book, The Dinghy Cruising Companion, when it was published in 2014. 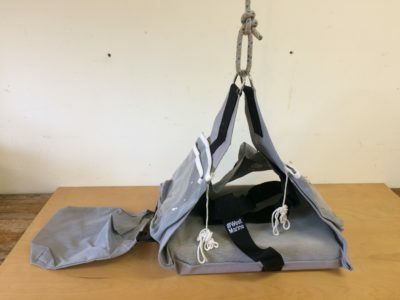 It is a simple and clever way to anchor a dinghy without using a clothesline loop or outhaul set up. 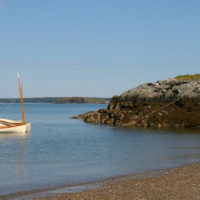 As described, a Pythagorean mooring, named after geometry’s theorem of right triangles, is most useful in settings where tidal range is modest and where there is fairly deep water close to a shoreline. Joe Haynes grew up in Detroit with three brothers and two sisters. Their father, once a tight end for the University of Michigan football team and later an Army sergeant who stormed beaches in the Pacific during World War II, was a very athletic man, but in spite of his best efforts to get his kids involved in sports, none of them showed any interest. 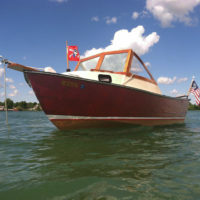 The family moved to Algonac, a small town tucked in a bend of the St. Clair River, which flows from Lake Huron to Lake Erie and separates the state of Michigan from the province of Ontario. Surrounded by water, the kids gravitated to boats. The first boat in the family was a derelict wooden boat Joe and his twin brother fished out of the river near their home. They patched the leaks with tar and used the boat to explore the river upstream and down. 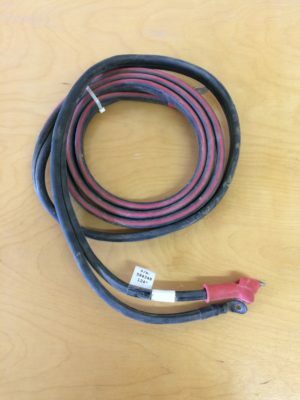 If you have a centerboard or rudder blade that is deployed with a downhaul, it won’t kick up if you have the line made fast to an ordinary cleat. Clamcleat has a cleat that will trip and release the downhaul, preventing serious damage. If you keep at it long enough, rowing will toughen up your hands, but callouses often come at a cost. We take a look at some gloves that will give you a shot at skipping that painful blister phase.